Welcome to Cheat Sheet, our brief breakdown-style reviews of festival films, VR previews, and other special event releases. This review comes from Austin’s Fantastic Fest. But a lot of the fun was from the voices the two men brought to the exchange. Wendig largely matter-of-fact and supportive about the idea that Sykes was charging through the woods murdering people with a machete, Sykes blissfully naïve and eager for more words of wisdom about his inevitable doom. The film adaptation, directed by Brett Simmons (Animal,Husk) and co-written by Simmons and Thomas Vitale (producer of films likeSharknado,Battledogs, andRobocroc), doesn’t entirely capture that upbeat, no-harm-no-foul sense of two buds cheerfully talking through a minor scrape one got into over the weekend. Instead, it finds its own completely irreverent tone, while mixing in some over-the-top gore. Horror-comedy, and more comedy than horror. There’s plenty of blood and plenty of emoting desperation, fear, and misery, but none of it lands with any weight in the wake of the raucously silly premise and tone. Joss Whedon favorites Fran Kranz (Dollhouse,Much Ado About Nothing) and Alyson Hannigan (Buffy The Vampire Slayer) play Sam and Chuck, a pair of longtime buds who seem to trust each other completely. So when Sam ends up in the woods, covered in blood and fleeing a murderer who’s wiped out most of the other counselors at his family’s camp, he naturally calls Chuck to ask for help. She listens to his story, then asks… has he considered thathemight be the murderer? His story doesn’t add up, the blood spattering his body doesn’t seem to be his, and every new question she asks leads him to a new dire revelation. Before long, he’s concerned that yes, he might have gotten slightly possessed by evil and murdered a whole bunch of people in truly grotesque ways, including his unrequited crush Imani (Brittany S. Hall) who used him as a summer fling a year ago at the same camp. Chuck, who works at a comics superstore and knows a lot about the horror genre, is generally sympathetic to Sam’s situation but doesn’t hold out a lot of hope for his survival. She has to walk him through the specifics of the Final Girl trope, and she suggests a few survival techniques, but she seems pretty aware that he doesn’t have many options. Among other things, the evil force that’s gripped him seems irresistible, and even once he knows what’s going on, he can’t seem to regain control of his own body. Plus, his few remaining would-be victims have the laws of narrative on their side. But Sam is determined to wriggle out of his fate, in spite of the body count that suggests he maybe deserves retribution more than redemption. You Might Be the Killerisn’t really about hidden depths, it’s about drawing a goofy premise out to feature length and exploring familiar genre tropes in the process. Squint, cross your eyes, hold your breath, and turn on all your wishful-thinking activators, and you might be able to make an argument that it’s about responsibility and unintentional harm. Sam doesn’tmeanto hack anyone to gooey bits, but his good intentions don’t make any difference to his victims. And they matter even less to his victims-to-be, who are notably unsympathetic about his claims that none of what’s going on is really his fault. They just want to survive, and all his protests that he didn’t set out to kill anyone don’t diminish the pile of corpses in his wake. But the film doesn’t seriously contend with culpability, responsibility, or any other related fields, in part because none of it takes place in any recognizable real world. The emotions are giddily over the top and not meant to be engaged with on a real level, even in the occasional moments where they hit home. Sam’s pathetic wish for Imani to see him as relationship material instead of a short-lived good time is probably the most relatable part of the movie, but it isn’t ultimately revealing about one-sided relationships. The whole movie is just a cup of sweet, empty froth, flecked liberally with fake blood. It’s certainly fun. Simmons makes liberal use of big, red title cards counting down how many camp counselors have been slaughtered. (Initial count: “A LOT.”) As the film jumps back and forth in time to fill in the backstory of Sam’s murder spree, the number is constantly in flux. It’s a cheeky, grisly way to keep the timeline straight and give some separation to a string of characters who are mostly interchangeable by design. (Except for “Steve, the Kayak King,” played by Bryan Price as a cheerful, upbeat broseph who keeps humbly protesting that the camp doesn’t actually have kayaks, and he teaches canoeing.) 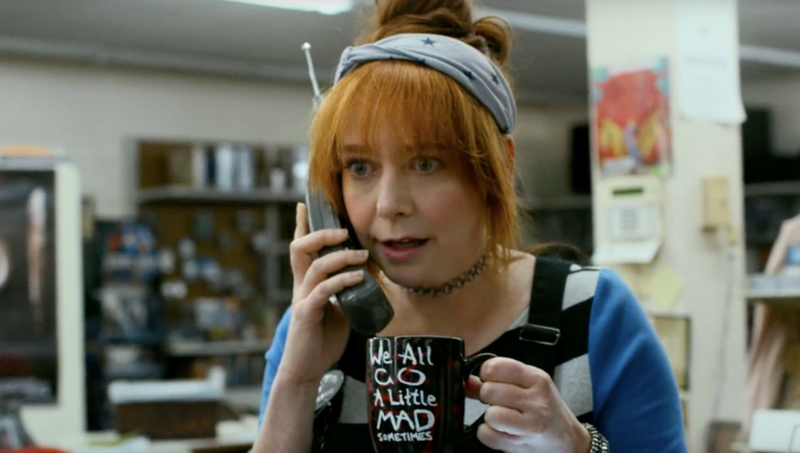 It also speaks to the tongue-in-cheek nature of the project, which comes across in everything from Chuck’s prominently displayed “We all go a little mad sometimes” coffee mug to the prominent placement of Sykes and Wendig’s books in her store. The protagonists’ casting helps as well. Kranz, who played a somewhat similar hapless-patsy-pushed-to-the-edge role in Drew Goddard’s memorable 2012 horror-comedyThe Cabin in the Woods, has made a career specialty out of characters who do awful things, but seem so sheepish, harmless, and befuddled that it’s easy to empathize with them anyway. Sam, who authentically believes the other camp counselors should stand down, stop trying to kill him, and forgive his past murders, comes across as a bit of a self-serving weasel, but he’s a victim, too. Kranz navigates Sam’s simultaneous innocence and dangerous selfishness nicely, and his clear consternation at the situation is one of the film’s better comic elements. You Might Be the Killerasks a lot less of Hannigan, who guides Sam through his unpleasant revelations with the frank, upbeat cheer of Willow onBuffyexplaining some particularly unpleasant bit of researched demon lore to the Scoobies. Her role really doesn’t pay off much. At one point, she whips out a pile of old occult books to research ways to help Sam, but they’re little more than an escalating visual gag. She’s mainly a sounding board and semi-narrator, but at least she balances out the narrative as the one person who’s unabashedly on Sam’s side. Mostly, the film is a series of amusing reveals for horror fans, who will recognize every cliché, broad reference, and stereotype in play here. It’s at its best during the opening moments when the premise comes into focus and Sam starts to realize how little he can trust his own perceptions and intentions. From there, it moves at the most reckless speed possible, with the filmmakers rightly intuiting that this is a pretty slight, one-joke premise that shouldn’t be dragged out too long. This isn’t challenging filmmaking, but for what it is — a shared social-media joke turned into a shared cultural joke — it’s a pretty diverting way for horror fans to spend about 90 minutes. Technically, it’s an R, given the pervasive, messy bloodshed: arms get hacked off, heads get cleaved open, and so forth, all as part of the slasher genre’s usual reverence for particularly over-the-top kills. But given the environment around all the bloodshed, it seems silly rather than horrifying. It’s essentially a PG-13. Syfypicked up the rights toYou Might Be the Killerafter its festival rounds and will premiere it on the network on Saturday, October 6th at 7PM ET… right after a 5PM showing ofCabin in the Woods. They’ll make a solid, gory, funny double feature.